We pursuaded our partner A.I. 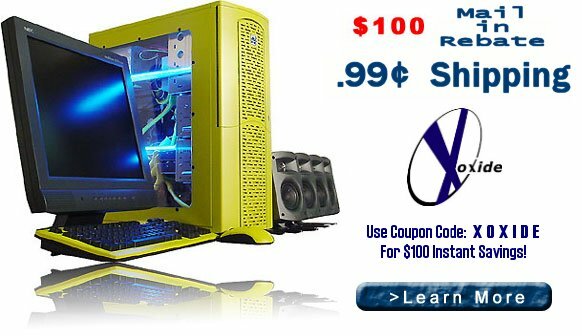 Systems into offering an exclusive discount to Xoxide customers. Until Thursday 11/28/02 at 11:59PM EST use the A.I. site coupon code "Xoxide" to receive an extra 100$ instant savings off any order! This can be combined with their current specials of 99 cent shipping, $100 mail in rebate and the free 17" monitor they are offering on select systems. Don't miss out, this is a rare chance to get stacked savings.